Tennant Creek Transport has announced the commencement of a door-to-door minibus service to start on the 20th of March. "Ever since we started the town service there have been some people who would prefer a service that takes them directly to their destination." said service Convenor Georgina Bracken, "Well this is the service for them". Service planner David Denmark explained that the service would also be a boon to many people with disabilities who also have difficulty getting to the town service bus stops. "The bus we use is wheelchair accessible and can pick people up at their homes and take them right to the door of their destination", he explained. NDIS participants can also use the service and have the cost billed against their NDIS budget. The service also offers a 50% discount for people who are registered members of the Taxi Subsidy Scheme. The service will run initially from 9 am to 3 pm (earlier for those catching the morning flight to Alice Springs) Monday to Friday. To make a booking call 0467 335 400. Tennant Creek Transport and Barkly Regional Council combined on Australia Day to put on a shuttlebus service to festivities out at Mary Ann Dam. Both agencies contributed to the cost of the service with volunteer bus assistants provided by the transport group. The service ran from 11.30 in the morning until the last service home at 6 p.m. Drivers Jerry Kelly and Adam Vibau picked up people at community living areas and points along the main street. TCT Convenor, Georgina Bracken told us that the service was a success with nearly 120 passengers. "It was great to see that almost half of the passengers were children who were treated to a great day out" she said. Volunteer Marella was happy to report that the service finished with a full bus on the final run. Tennant Creek Transport's charter service is growing, providing businesses and agencies in the region with another affordable transport option. "This is a great service for groups that do not have their own transport", said Business Manager David Denmark. It is also well worth agencies who do own minibuses to consider our service as an alternative to the expensive business of purchasing and owning vehicles and having staff wasting their valuable time on driving duties." He continued. Bus owners do not always consider the full costs of ownership. It goes well beyond what they pay for fuel, there are vehicle replacement, maintenance and repair costs to be taken into account. Putting replacement funds aside for a 20 seat minibus can be about $18,000 per year. Hiring the Tennant Creek Transport buses and drivers just when and where you need them can be a simple and cheaper option than running your own vehicles, David explained. Charter buses and drivers can be booked through bookings@tennantcreektransport.org, by calling 0497 487 789 or by using the link at the top left of this webpage. Due to the generosity of the Government's Remote Australia Strategy Program, Tennant Creek residents will soon be travelling around town in a brand new minibus. The bus, a Golden Dragon, has a much greater passenger capacity than TCT's other buses with 24 seats and will provide more space for passengers and baggage (mainly shopping) on the Town Service. It is also equipped with a wheelchair hoist to enable access for people with disability. The vehicle has a multicultural feel about it having an American engine, British gearbox, seats made in Australia and was manufactured in China by one of the biggest bus builders in the world. TCT bought the bus in Melbourne from Patico Automotive and it was delivered to Tennant Creek by volunteer driver Andrew Clark. The journey took in stormy weather in Melbourne and South Australia and the summer heat of the red centre. The bus will also be made available for charter work. Ring 0497 487 789 for more details or click on the charter link at the top left of this page. Jenni Kennedy, a founder member of Tennant Creek Transport, passed away earlier this month. The Board and staff have expressed their deepest sadness and wish to acknowledge her contribution to the transport group over the three years she served as a Board member. Jenni took an active interest in local transport issues and was one of the first people to put her hand up to set up a transport group for the town. After two years hard work the group established the Town Bus service which has been running since 2014. Service planner David Denmark noted that "While Jenni left the Board late last year she continued her support and was engaged in trying to find a way to have a bus shelter built for passengers joining the service at the Food Barn". The Board of TCT send their heartfelt condolences to Jenni's family and friends. In a generous gesture of goodwill the Barkly Youth Service has agreed that Tennant Creek Transport can use their minibus on the Town Service for the next six months. The bus has been re-registered with the Motor Vehicle Registry so it can operate the important public transport service. 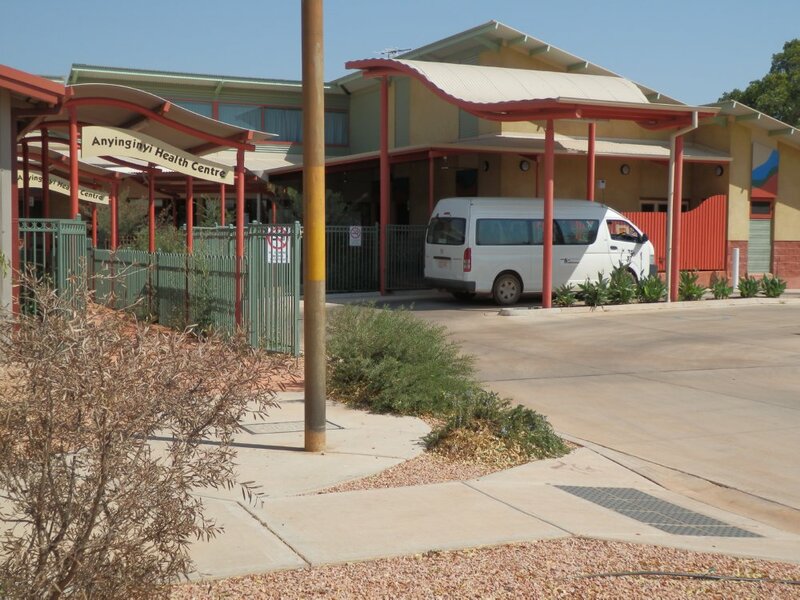 "This is a great example of non-profit agencies working together to improve the lives of Tennant Creek residents" said Tennant Creek Transport Convenor Georgina Bracken. "The bus was not being used at the Youth service as it is between funding grants so we are able to take our oldest bus off the road for a well earned rest and some maintenance" Ms Bracken explained. The Youth bus will operate on the Town Bus (the $4 bus as it is known locally) and the wheelchair modified bus will continue to be used on the Minibus service which provides people with a disability affordable transport options in town. We are sorry to have to announce that the early morning bus service which has been operating between 6 a.m and 9 a.m. has been suspended. This service, which was funded by a charitable foundation, was not patronised quite enough to keep it going. Transport Planner David Denmark explained that "Given that Tennant Creek Transport has just started an exciting new door-to-door minibus service which will require all of our resources to make a success, the loss-making early morning service will have to close until we can find a body to provide an ongoing subsidy". Tennant Creek Transport convenor Georgina Bracken said that she hoped that the service could be started again in the near future and that the group are working hard to find a way to make the service viable in the future. The service had a number of regular users who will have to find another way of getting to work. "It's like a taxi service - just ring up and book"
Tennant Creek Transport has just announced that a new Minibus Service is to commence on Monday the 18th of April in Tennant Creek. The minibus will operate a bit like a taxi with passengers being able to ring up and book a trip. "This is the result of many months of hard work by the Tennant Creek Transport Committee" explained transport planner David Denmark. "Since the taxi left town there has been no demand responsive service in the town. While the town bus does a very good job it runs on a fixed route and this does not suit everybody" he continued. The service will enable people to obtain transport to and from the airport and to other places not on the current bus route. An accessible bus will be used and eligible people with disabilities will be able to register on the Taxi Subsidy Scheme and enjoy a 50% fare subsidy. Fares will be a flat $10 per passenger to anywhere in town. Passengers can call 0498 457 830 to book a trip. Morning service to start at 6 a.m.
Tennant Creek Transport has announced an earlier start for its morning bus service after consulting with employers around town. “Many of Tennant Creek’s employers start at or before 7 a.m. so we have decided to start our early morning service an hour earlier at 6 a.m.”, explained Service Planner David Denmark. The service operates for three hours until 9 a.m. Passengers can use the regular Town Bus service which operates on a slightly different route to get home. The service route covers Tennant Creek’s six main community living areas and serves the industrial area around Brown and Maloney Streets, the area around Whippet Street/Weaber Road and stops along Paterson Street. The early morning service was been funded for six months by the Australian Ethical Foundation and has about four months to run. Fares have been set at $4.00 one-way, the same as the regular Town Service (known locally as “The Four Dollar Bus”). Mr Denmark explained that while anybody can jump on the bus and pay a cash fare, employers can purchase tickets at a discount or could arrange for employees to agree to deductions from their pay to obtain the tickets. Tickets can be purchased on this website by clicking on the "Order Tickets" button at the top of the panel to the right of this article. “We hope that this will make the journey to work or training easier for people, particularly in the hot months and when the rains come. We are thankful for Australian Ethical for making this important service possible” said David. Timetables and route maps are available from the Tennant Creek Transport office at 0497 487 789 by email at coordinatortct@gmail.com or can be downloaded from the link on the right above on this webpage. 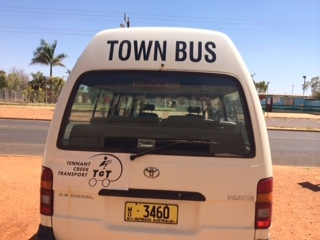 Tennant Creek Transport is a not-for-profit group founded by a group of local people who are working towards developing and improving public and community transport in the Barkly region. We currently run a town bus service in Tennant Creek - click on the Town Bus Timetable button at the top right of the screen for more information about the service. We also provide occasional charter services to events. 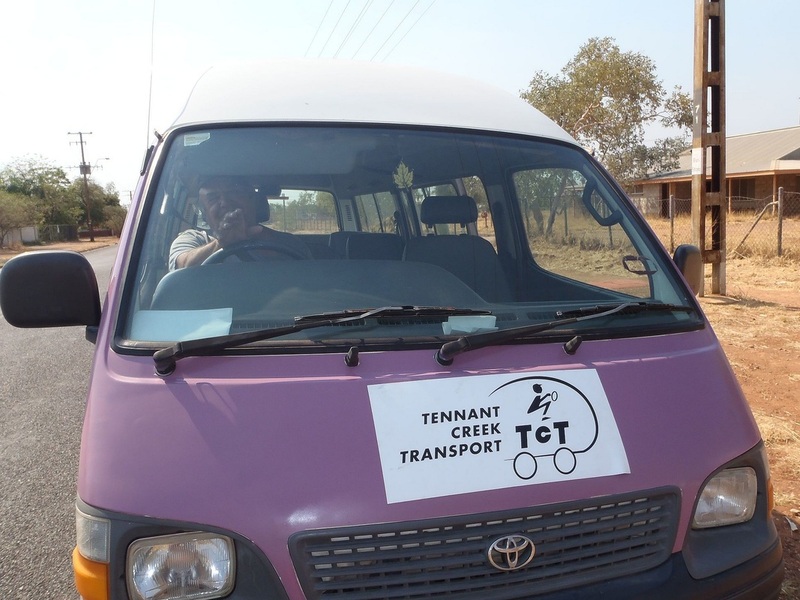 Tennant Creek Transport receives no recurrent funding and depends on the goodwill of the community, Foundations such as Centrecorp and support from the NT Department of Transport to survive. The journey is often challenging but we think that as long as there is a will there is a way. If you would like to help us please make a donation by clicking on the 'Make a Donation' button in the top right hand corner of the page. Tennant Creek residents are now enjoying a new bus service which is running five days a week throughout the town. The service is the first of its kind in Tennant Creek and started just as the town’s only taxi suspended its operations. Two years ago a report published by NTCOSS highlighted the problems some Tennant Creek residents have in getting around town and accessing essential services such as shopping, the hospital and other services in the centre of town. In response a bunch of dedicated residents formed a non-profit transport group Tennant Creek Transport (TCT). The group spent nearly two years trying to set up a bus service assisted by a grant from the Centrecorp Foundation and support from local agencies and Tennant Creek Advisory Board. Earlier this year TCT engaged a transport worker, Charlie Richardson, to apply for approval to run a public bus service and to find and train some drivers. Charlie finished his work in July having set up the town’s first bus service. The work was then taken over by the two new drivers who have achieved endorsement by the NT Department of Transport and a very hard working committee. Lead by Convenor Georgina Bracken, the group continues to manage the day to day tasks involved in running a bus service. 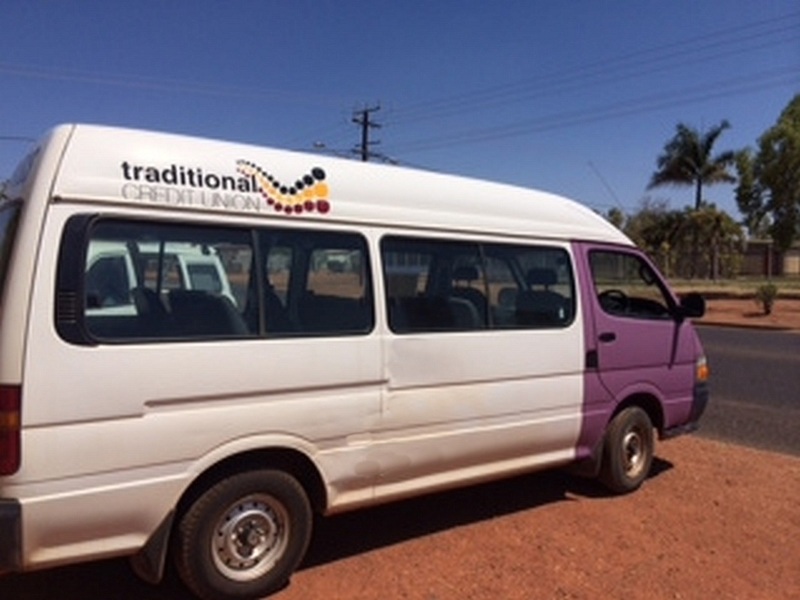 The service uses a bus loaned to TCT by Barkly Arts. The bus service is open to any member of the public, and its route is designed to make it easy and convenient for people living in the Town Living Areas to get to Tennant Creek’s only supermarket, to Centrelink, to the hospital and Anyginginyi Health Clinic and to other services in the main street. The service also helps to people keep in touch with and visit relatives and friends living at the opposite end of town. The service has now been in operation for 10 weeks and runs once an hour 5 hours a day, Monday to Friday. Tickets can be bought on board ($4 and $2 for children) or pre-purchased from the Food Barn. If you want to catch the bus obtain a timetable from the Food Barn or from local community agencies. You can also ring the driver on 0455 033 506. Look out for the purple bus and jump on board! Plans for a new minibus service for residents of Tennant Creek received a boost this week with the arrival of a project officer to kick-start the process. The Tennant Creek Transport committee has appointed Charlie Richardson to guide the establishment of the service through the next few months. Committee members welcomed Charlie to Tennant Creek earlier in the month and showed him around and introduced him to community organisations and members. "I've had ten years of running community transport services in NSW but I have a lot to learn about running a service in an area like Tennant Creek, so I hope that local will be patient and give the project their support," said Charlie. A town mini-bus service should be up and running in a couple of months. One of the aims of the service is to provide a flexible service that can transport people from the town living areas and provide them with access to the shops, services and other transport links. "Transport is the link between where we live and everything that we do," Charlie said, " A lot of people, especially people with disabilities, older people and people with young kids really struggle to get to the shops and back with their purchases. I am sure it is even harder in the height of summer". There are a number of hurdles to get across before the service can start and people's input into how the service should run, what fares might be charged and who it will best serve will be important. Charlie and members of the committee met shoppers outside the Food Barn in mid-March to ask what sort of service would suit them. The project has been funded by the Centrecorp Foundation in Alice Springs. The committee in charge of the service is dedicated but small and so needs more new members. If you would like to see the service succeed, call Charlie on 0402 913 368 or email him at charlie@tpmplanning.com. The Annual General Meeting of Tennant Creek Transport Inc. is to be held on the 29th of April at 4 p.m in the Barkly Electoral Office. People who are interested in applying to become members are welcome to attend. Click on this link for an application form. At the AGM a report on our activities since we started will be presented and a new Committee of Management will be elected.